Monday (Separating the Tebow haters) edition: Wha' Happened? We admit to being fascinated by Tim Tebow on multiple levels -- from the standpoint of his personality, his development as a quarterback and how he is perceived/covered by fans and media members. Throughout 2011, he became either the greatest story or the greatest punchline, depending on which side of the dividing line you were on. Plenty of the love was blind love -- or at least people creating a story of miracles out of a few nice comebacks that were, by and large, necessitated by Tebow's shoddy early play and enabled by a defense that allowed 13 points or fewer in four of six games during a playoff-propelling winning streak. Plenty of the hate was blind hate -- dismissing every good thing Tebow did on the field as luck, coincidence or (mockingly) something divined by the prayer he takes very seriously. Regardless of how Tebow's career develops from here on out, though, we do think Sunday's overtime victory over the Steelers offers a new and clearer dividing line -- not between those who love and hate Tebow, but those who question him for the right reasons and the wrong ones. As Tebow's Broncos lost three consecutive regular-season games after the aforementioned six game winning streak that was often defense-aided -- with their QB spraying bad passes all over the field -- it was fair game to wonder if he was a short-term fad. It also offered a heyday for those who wanted to mock Tebow for more personal reasons. We were not immune to a few well-placed one-liners, to be sure. But after a guy throws for 316 yards, with a 125.6 rating and hooks up on a perfectly thrown TD strike to win a game in overtime over one of the greatest postseason franchises of this era ... well, he deserves some slack. Tebow earned a certain measure of respect in Sunday's victory over the Steelers. It's not to say he won't throw more wobbly ducks over receivers heads or into the ground. But a playoff victory -- and one largely because of him, not in spite of him -- means it's time to take Tebow seriously as a QB. You can still question his long-term viability. But the true haters remaining -- as the kids like to call them -- are those who dislike Tebow for altogether different reasons. 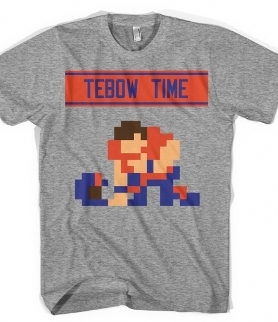 (Tecmo Bowl-style shirt, $18, found here).